Carla McRae aka The Paper Beast is an illustrator who re-imagines the whimsical dreamscapes of a simpler life with shapes drifting through our environment. 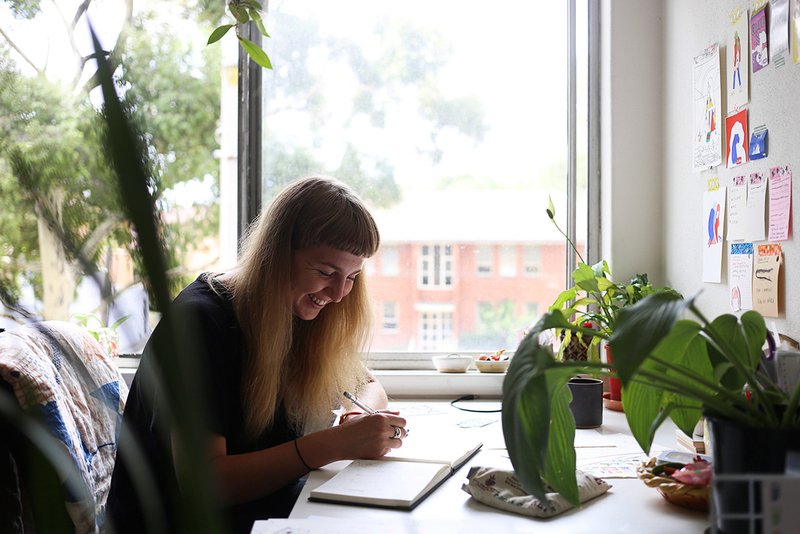 A Sunshine Coast native and educated, McRae now lives and works in Melbourne. Her CV ranges hugely between murals, graphic design, wrapping paper, socks, books, workshops and even a food packaging collaboration. McRae has been an inspirer since she was little with her vast amount of drawings building up in her bedroom since she did a big purge recently. Her parents commented what a busy girl she had been, which continues today. Checking out her website you can realise the vast amount of projects McRae has been completing. The artist term is still one she adjusts to, yet her income is solely generated through her illustration- rendering her self entirely to the artist job title. McRae comments on the crossing of disciplines between commercial and personal as both a feeding and inspiring process. The commercial can both fund the personal artwork and in turn provide a different source of creativity, giving her the chance to draw things she wouldn’t usually. You can pick those elements looking through at her different works. Her own, inspired by nature and surroundings, generated by “being attentive to the small bits and pieces of living.” This quote reminded me of something my old art teacher said: she confided in us that she didn’t need drugs in the 60s, colours would just “pop” out at her. At the time the whole class laughed yet as I grow older I find that the artist in you does pull you to the more beautiful, elements in life. Within McRae’s paintings, we see an abstraction of figures, bright colours and shapes in which the characters lend towards a simple style yet the composition is simplistic in its minimalism. Carla mused on how inspirational everyday life can be, from signage, buildings, clothing, plants, shadows. These elements appear to float through her canvases or online pieces, into physical walls. The adaptation of life and the experience of going to new cities pull in new inspiration, as McRae tries to capture mental screenshots. The images that photographs can’t grasp. Perhaps as our own emotions play into the experiences, the camera lacks the tenure of smell, feelings, touch. It’s that replication of fleeting instances within her works which allude to a presence behind the painting. McRae shared that the mural in Tasmania was one of her favourite murals as it was both fun and her first trip to Tasmania as well. The mystic of Tasmania seems to continue as through the generation of the mural David and Carla painted a duo who could look like twins, unbeknown to them the lady who owned the heritage-listed house had twin daughters. The characters on the wall even without mirroring each other styles, seem to share the bond of sisters, linking fingers, sharing a secret. It’s exciting to wait and see what the future brings for Carla, but it looks bright and colourful. Just like her art.